Hermit Crab Crunchies | Zoo Med Laboratories, Inc.
Open container and remove one “Hermit Crab Crunchie” per Hermit Crab being fed. 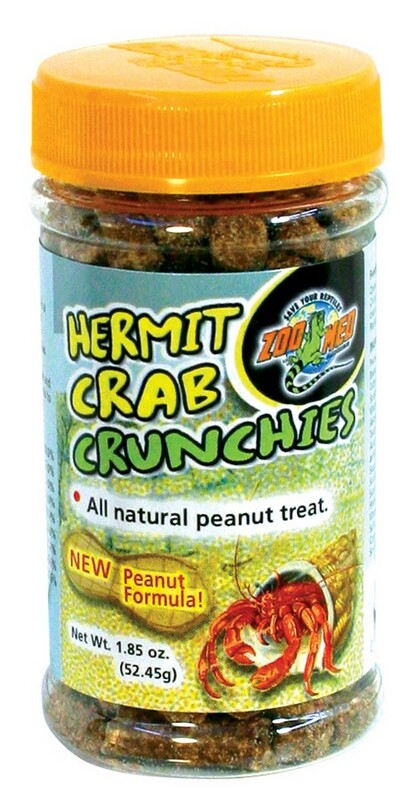 Place Hermit Crab on top of food. For best results, moisten food. Replace uneaten food daily. Peanut Meal, Ground Wheat, Whole Dehulled Peanuts, Ground Lima Beans, Calcium Carbonate, Monocalcium Phosphate, Dicalcium Phosphate, Salt, Yeast Culture, Vitamin E Supplement, Folic Acid, L-Ascorbyl-2-Polyphosphate (Source of Stabilized Vitamin C), Mixed Tocopherols (preservative), Rosemary Extract (added flavor), Ascorbic Acid (preservative), Citric Acid (preservative), Choline Chloride, Vitamin A Supplement, Vitamin D3 Supplement, Menadione Sodium Bisulfite Complex (Source of Vitamin K Activity), d-Calcium Pantothenate, Riboflavin Supplement, Niacin Supplement, Thiamine Hydrochloride, Pyridoxine Hydrochloride, Biotin, Vitamin B12 Supplement, Manganese Sulfate, Zinc Sulfate, Ferrous Sulfate, Copper Chloride, Ethylenediamine Dihydroiodide, Sodium Selenite.